Nick is a great soccer player and his team has just gotten an invitation to an important competition in Dallas. His best friend plays for a rival team and the two boys will be going head to head. But in the weeks before the competition, Nick encounters a lot of problems. 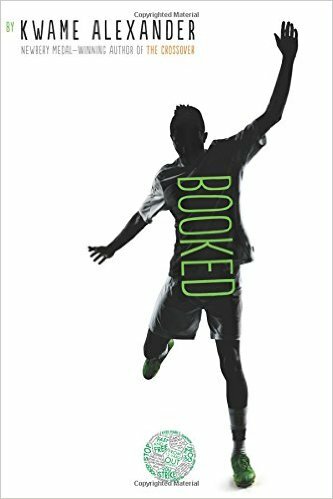 He can't seem to talk to the girl he likes, his parents announce they are separating, his dad continues pressuring him to build his vocabulary by reading a dictionary he wrote, and a health issue might prevent Nick from attending the match at all. I wasn't a big fan of The Crossover but I was okay with it. This book grabbed me even less than Alexander's first as it felt more like a book that appeals to adults, librarians in particular, than it will to kids. It seems to be blatantly schooling the reader on how cool it is to know big, unusual words (something adults would find appealing) as well as how you can turn a non-reader into a reader with some classic lit. Neither of those plot points are going to help me sell this book to teens in my library. I will admit that I didn't get all of the basketball play by play in The Crossover but my students who like basketball did so i can appreciate that and use that as a selling point. I feel that the soccer tie-in here is not strong enough to bring in my soccer players who have to read something for class. The whole book feels like a check box of things meant more for adults than kids. Including the incredibly hip ex-rapper librarian.